Prolific artist and woodworker Jay Nelson just built his latest masterpiece: A 200 square foot house that, despite its diminutive size, looks anything but tiny. 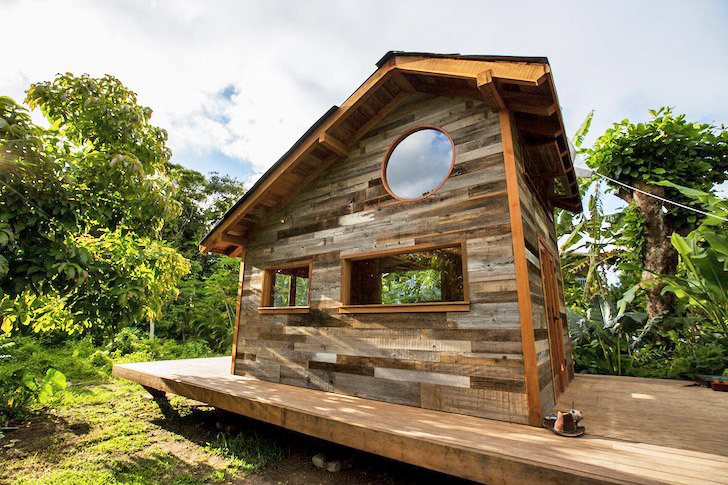 Located on the Hawaiian island of Kauai, the small wooden cabin was built from 25,000 pounds of salvaged redwood in less than two months. 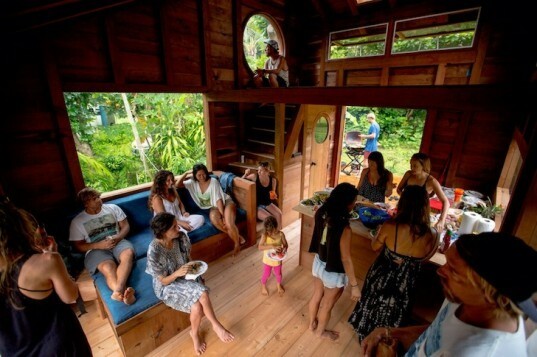 Nelson has built everything from adorable wooden car campers to airy, multi-story treehouses. Completed just last week and made from salvaged materials, his 200-square-foot house was created in his signature geometric style and features asymmetric rooflines. The house was built atop a platform to avoid potential flood damage. Inside, giant windows and a skylight open the house up to natural light, crosswinds, and views of the surrounding tropical paradise. For a touch of whimsy, Nelson punctuated the home with circular windows on the loft level as well as on the bathroom door that’s tucked beneath the stairs. The open plan setup and high ceilings help create a sense of spaciousness. To expand the size of the house for entertaining guests, the folding doors open out to the platform to create a seamless space between the interior and exterior spaces. This is an amazing project! I am working to create something like this in the future! Thanks for sharing! Nelson built the bulk of his small wooden cabin out of 25,000 pounds of salvaged redwood in less than two months. A housewarming party for the newly completed house. The open plan setup and high ceilings help create a sense of spaciousness. The house was built atop a platform to avoid potential flood damage. Inside, giant windows and a skylight open the house up to natural light, crosswinds, and views of the surrounding tropical paradise. For a touch of whimsy, Nelson punctuated the home with circular windows on the loft level as well as on the bathroom door that's tucked beneath the stairs. To expand the size of the house for entertaining guests, the folding doors open out to the platform to create a seamless space between the interior and exterior spaces.